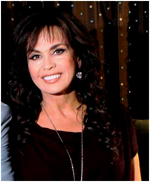 Marie Osmond, along with Dr. Jeffrey Borenstein, spoke Monday to Chesapeake Energy Corp. employees about the importance of seeking help when suffering from depression and anxiety. It's hard to find a photograph or see a performance where Marie Osmond is not smiling. But when Osmond gave birth to her son, Matthew, in 1999, she went into a place of darkness. She said she felt as if she were an alien in her own body, and losing her sense of self. on 60 pounds, and the television producers were saying I had to drop it all in four weeks, and be perky and cute and happy — I couldn't even wash my face and pick something to wear,” the longtime entertainer said Monday in a visit to Oklahoma City to speak to Chesapeake Energy Corp. employees. Osmond was experiencing postpartum depression, a form of depression an estimated 11 to 18 percent of women report experience after having a baby, according to the Centers for Disease Control and Prevention. Overall, an estimated one in 10 adults in the U.S. suffers from depression, according to the CDC. Additionally, about 12 percent of adult Oklahomans have some form of depression, with about 6 percent experiencing major depression, according to the CDC.